Over the last decade we have gained extensive knowledge in the practical application and installation of a wide range of environmentally friendly and ecological building materials and systems. 40% of all the wind energy in Europe blows over the UK, making it an ideal country for wind turbines! A typical domestic system in an exposed site can easily generate enough power to satisfy a home as well as reducing its carbon footprint. Wind turbines can be pole mounted or fixed to an existing building depending on the best location for installation. Through Feed-in-Tariffs it is also possible to get paid for the electricity generated which is not used. further helping reduce household utility costs. As part of one of our latest ecological development projects we installed a 5kW wind turbine, which is providing a very good return of investment for the client. A great way to save money on your heating bill, these usually fit to your roof and link into your hot water system. They can provide up to 70% of your annual hot water needs. Even during the cold season the sun has enough power to provide up to one third of your heating requirements. We have installed and seen excellent results from Velux Solar Heating Systems. Produce your own clean and renewable energy using solar panels. These capture the sun's energy using photovoltaic cells and transform it into electricity. Solar panels do not need direct sunlight to operate – engineers have developed solar panels specifically optimised for the great British weather! Solar panels can be used to run household appliances and lighting, saving money and reducing your carbon footprint, and any excess produced can be sold back to the grid offsetting electricity you in the evening. With the government incentivising renewable domestic energy schemes, many investors are turning away from traditional methods in favour of this more enticing alternative. Current Building Regulations require extractor fans in all wet areas of your property including the kitchen, bathroom, utility, en-suite and WC's to control condensation. This removes warm and often damp air allowing cool air to return into the property through trickle vents in windows. This is a source of energy loss because the cold air flowing into the building needs to be heated. Heat recovery systems are designed to completely change all air in the property at least once every two hours, continually replacing stale damp air with fresh, warmed, clean, filtered air. By installing a heat recovery system your home will benefit from filtered fresh air and it creates a healthier indoor environment. It will provide a climate in winter similar to having your windows open on a warm summer's day, but without the problem of heat loss, insects, pollen or dust being drawn into your home. These systems are up to 90% efficient and are becoming more and more popular with the stringent air tightness testing. More information about air tightness is provided further down this page. These are a great way to reduce your mains water consumption. The water collected from your roof is filtered and stored below ground. This can then supply toilets and appliances like washing machines, as well as outside taps for gardening. Rain Harvesting Systems can reduce mains consumption by up to 50%; it will also reduce the amount of water discharged into the drainage system. We have installed a number of these systems including Wisy. Geothermal pumps are a network of water pipes buried horizontally or vertically in your garden, with a heat pump at ground level that pumps a mixture of water and anti-freeze around the pipes. Heat from the ground is absorbed into the fluid and then passes through a compressor that raises it to a higher temperature. Electricity is used to run the heat pump, however most of the energy for heating is taken from the ground, therefore producing less greenhouse gas than conventional heating systems. If the heat pump is run using 'green' electricity (e.g. generated by wind or solar power), the system can become 'carbon neutral'. Ground source heating systems work very well with low heat applications like underfloor heating, and we have seen great results from equipment manufactured by Stieble Eltron. Air source heat pumps have now become a sustainable way of heating your home, using radiators, under floor heating systems or warm air convectors. These systems can also be used to heat water. An air source heat pump extracts heat from the outside air in the same way that a refrigerator extracts heat from inside the fridge; it can extract heat from the air in temperatures down to -15 degrees Celsius. Air tightness testing is the procedure to trace any unwanted draught and uncontrolled airflow through a house. Too much air leakage leads to heat loss resulting in higher C02 emissions and higher heating bills. Reducing C02 emissions is the purpose of 'Part L' of the new building regulations which sets out criteria on air tightness testing, air leakage testing and air permeability testing. We have installed a range of products from companies such as ProClima and Klober to achieve air tightness in both domestic and commercial projects. Insulating your property or business is a cost effective way of saving money. The better insulated your property is, the less money you will spend heating it. Insulation can come in many forms throughout a building, from glass mineral wool to high thermal performance rigid insulations, rigid insulating foam to bonded insulated cavity closers, there is a multitude of applications available covering all budgets. We have installed a number of high performance eco insulations; including Thermafleece which is made from sheep's wool and recycled polyester, and Knauf Earthwool which is made from 100% recycled glass bottles. 35% of heat loss in a dwelling is lost through the walls. A great way to dramatically reduce this heat loss is by using an External Wall Insulation System. 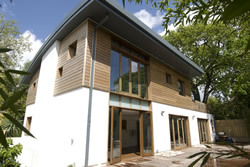 Existing houses can be clad with the system, which wraps the property and creates a thermally resistant envelope. New Builds or Extensions can benefit by incorporating the system, which can often make the construction quicker, more cost effective and visually appealing. Insulating Concrete Form is a system of formwork for concrete that stays in place as permanent building insulation creating energy-efficient, cast-in-place, reinforced concrete walls, floors, and roofs. It is the ultimate in sustainable construction; used in place of traditional cavity wall construction to achieve unmatched U-values helping create zero energy buildings. Concrete Formwork Block walls are created using hollow polystyrene interlocking blocks that when filled with concrete create a very fast, strong and cost effective building process. Produced from secondary/recycled materials and used to build the core structure of your house or extension; these blocks meet Responsible Sourcing Criteria featuring an 80% recycled content. Remarkable u-values can be achieved using low e and Argon filled double glazed units. These types of glass have advanced coatings to retain more internal warmth whilst capturing free energy from natural daylight, while at the same time helping lower your energy bills. Log burners are becoming more and more popular as a cost effective way to heat a room, but why not install a log burner with a back boiler that can provide 100% of your hot water and central heating needs! We have installed and would recommend Dunsley Heat Stoves for a stylish and efficient smokeless fuel burner. Breathable roof membranes have been around for some time now, used to replace the unsatisfactory bitumen felts of the past. When a high specification of felt is required we recommend using a product like ProClima Solitex Plus.